This is the best count I can see given the current squiggles. If my placement of (iv) is correct, the market will likely make a (very) short term bottom today. If my placement is incorrect, and we move (iv) over to the print high, we should get one more up-down than shown on the chart, to a marginal new low/double bottom. There is an outside chance that this is the start of something bigger; the strength and speed of this wave so far gives rise to the possibility that this may not be the wave v we've been looking for. 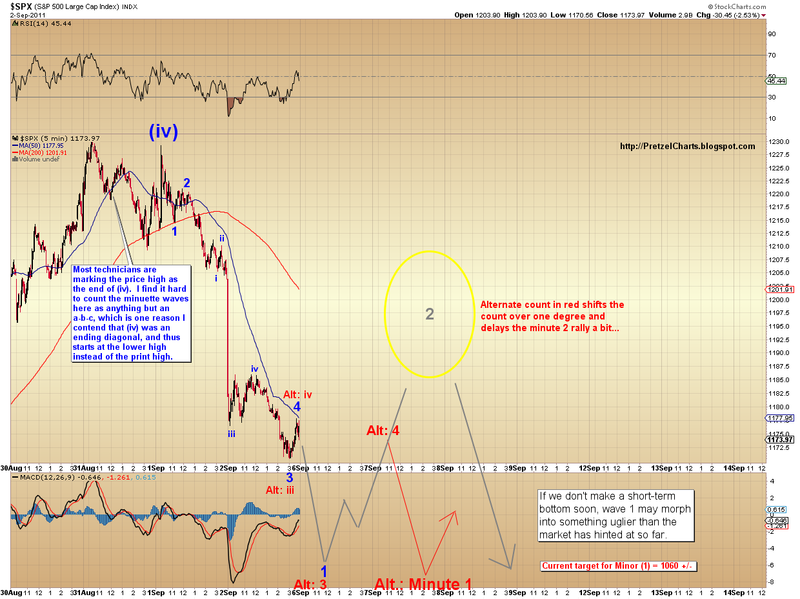 If you refer to my SPX chart a couple posts down, the wave labeled as the large (iv) may in fact be (2) minor. 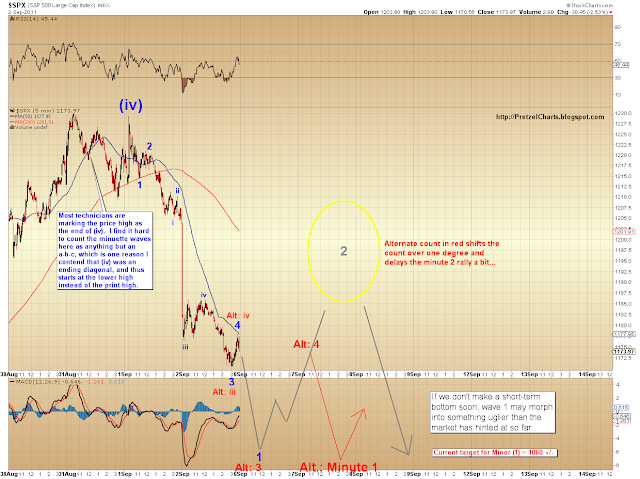 If that's the case, this is likely wave 1 of i of (3) minor, which bodes very ill for this market. No need to throw out the preferred count yet, though... until we're given concrete reason to think otherwise, we will stick with the preferred view that this is wave 1 of v. I don't consider it likely that this is the start of minor (3), but the possibility exists, so I wanted to bring it to your attention. Please note that this is the most likely preliminary count, but with the futures acting crazy tonight, the cash open may bring other possibilities. At that point, we'll have to see what what form the waves take -- and how our confirming indicators look -- to determine if any adjustments are needed.